Oh say, have you seen the model village at Bourton-on-the-Water? It was built in the mid-1930s by a local publican and recreates the village as it was at the time in Cotswold stone, at a scale of 1:9. 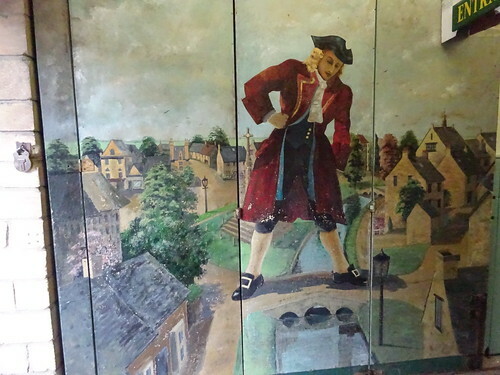 Being, as you know, interested in the Cotswolds' children's literature connections, I wanted to know about the origins of this picture. It clearly wasn't recent, but did it go all the way back to the village's construction, over 80 years ago? I tried to project myself into the mind of such a model maker and thought how he must be always living in two worlds at once — the actual and the miniature. How he must subconsciously be changing from the powerful Brobdingnagian when in his own workshop to the apprehensive Lilliputian when he battles in the vast world of reality. This kind of thing is very apropos for my own project of course, and a voyage to Japanese Tripadvisor convinced me that many Japanese do indeed enjoy the experience of being a giant in the model village and juxtaposing it with that of the larger original. 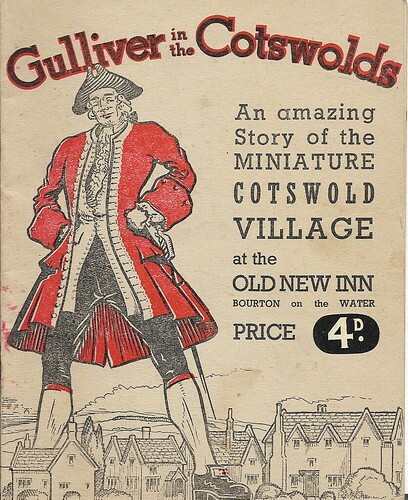 (Mise en abyme fans will be pleased to know that the model village contains a model of the model village, which in turns contains a model...) They write of feeling "feeling just like Gulliver" (すっかりガリバーになった気分だ). Recent conversations revealed that the image of Gulliver tied down by the Lilliputians had misled not one but two of my Japanese friends into believing that the story of Gulliver was that of a giant - a figure more like John Bunyan. But of course, to the Lilliputians, that was indeed the case.